Small size dp sensor for measuring differential air pressure on HVAC, compress air and pneumatic control systems. 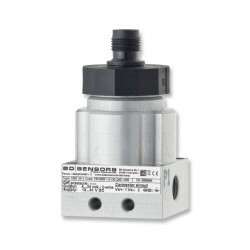 The DMD 341 is a very small compressed air differential pressure sensor suited to installations inside compact systems requiring many sensors for monitoring the switching and delivery of compressed air to plant machinery. The DM341 can also be used to monitor high air flow rates in heating and air conditioning systems. The DMD341 is used to measure pressures in the range of 0-6 mbar up to 0-1000 mbar differential. Output signals of 4-20mA, 0-20mA or 0-10Vdc can be chosen for the DMD341 to suit the signal conditioning of most air handling management systems. The low cost Aluminium construction and incorporation of, for air only sensor components, makes the DMD-341 an economical choice for large quantity applications. For applications requiring the measurement of air pressure in both directions the DMD341 can be supplied with either 12mA +/-8mA, 10mA +/-10mA or 5Vdc +/-5Vdc signal out. Measure the differential pressure across an air filter fitted in a climate chamber. Measure the pressure difference generated by a cooler fan to control air temperature. We require a fan system to speed up or slow down if air pressure is below or above atmospheric pressure in the sensing environment. According to our test results we find that the blower cannot exceed 500Pa. To measure both negative and positive pressures no higher than 500Pa we would suggest The DMD 341 with a -6 to +6 mbar range. My application is in the cotton industry, and we would like to measure the pneumatic pressures from -100 to +100 mbar on our various push and pull fans to monitor for blockages. I am interested in a 12 +/- 8 mA option. We wish to control a VFD on a dust collector system with a DP sensor to maintain a constant flow and reduce energy costs. The typical DP readings are 1000-1500Pa. Can the DMD341 sensor do this? We would suggest the DMD341 with a standard 0 to 20 mbar range which is equavalent to a 0 to 2000 Pa. Please select the options you require for the DMD341 Compact Differential Air Pressure Sensor in your application and request a quote. Send us your enquiry for DMD341 Compact Differential Air Pressure Sensor to get assistance with this product type.